Thomas Was Alone, Mike Bithell’s charming 2010 platformer about the inner lives of hopping geometric shapes, was an experiment in the power of storytelling to triumph over abstraction. Volume, Bithell’s new game, is also a successful experiment in abstraction, although the narrative is realistic, or realistic science fiction. This time, it’s the interactions that are stripped to their essences. Thomas and his friends—no, not that Thomas and Friends—were monochromatic and voiceless, given life only by the player’s actions and, even more so, by Danny Wallace’s narration. In Volume, the characters are (mostly) humans, who speak and have bodies and wear clothing and live in the futuristic and of course dystopic England of 2054. Each of the 100 levels in the game is carefully explained in the fiction: You learn who owns the structure you’re about to steal from, what type of building it is, and what the player is supposed to do while inside. There’s even a robustly plotted explanation for the existence of Volume’s user-generated levels. There’s nothing wrong with any of this stuff. Much of it’s quite good, in fact. Still, it doesn’t add anything to the thrill of the game’s interactive insight: Abstract and symbolic information, clearly presented, can make a stealth video game more intense—and, equally important, less annoying—than a realistic representation. 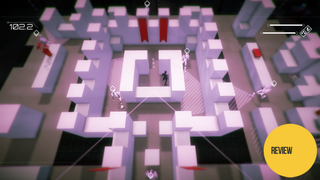 Bithell has taken the familiar elements of the stealth game—sound, visibility, the alert levels of the guards, etc.—and rendered them plain and visible to the player. This makes the game readable and masterable. The plot is a little more opaque. Robert Locksley, the player-character, has partnered with Alan, a dryly amusing AI (voiced by Danny Wallace), to steal stuff—money, artwork, data—from the oligarchic ruling class. He’s doing it on a livestream in simulated environments that Alan creates, so that others can copy his efforts. Or something. The backstory is mildly complicated, told through a mixture of cut scenes and in-game text and dialogue. Yet while I was sometimes confused (only slightly) about what was going on in the story, I was never confused about what I was supposed to do in the game. Here’s what Volume looks like, during an early level. The stuff Locksley is supposed to steal is always represented as white gems, an abstraction that makes them reminiscent of Pac-Man pellets. The robots he must evade have vision cones to indicate the precise areas they can detect. If a robot’s vision does not extend below a short wall, the colors in the cone darken, as if in shadow. The player can then make Locksley sneak past those robots by using the left trigger to make him cling to the wall as he creeps past. If Locksley makes a noise, either by whistling with a button press or by stepping on a noisy tile, the distance the sound travels is marked by a circle. Checkpoints are indicated by columns of diamonds. All of this sounds kind of complicated when I explain it in words. But it’s simple in action. I’m reminded that the rules of the wordless Tetris take up two pages when written out in text in Rules of Play, the game design textbook by Katie Salen and Eric Zimmerman. One thing that you apparently can’t fix, even in a stripped-down stealth game, is that the AI of your opponents must sometimes behave in totally ridiculous ways. When you’re confronting human guards in Thief, their willingness to give up the chase after five seconds is always a little hard to swallow. It’s not easier in Volume, but at least they’re robots. Each of the 100 levels is quite short. I’m pretty sure I never took more than five minutes to crack any individual level, and it usually took me much less time—except for level 52, which took me 25 minutes because I forgot that Locksley can whistle. Yes, that’s practically the first thing you learn in the game. But it was easy to forget, because the game is so generous with new techniques, rolling them out every time you’re at the risk of getting bored. There’s a bugle that bounces sounds off walls and behind guards, or in front of them. The “oddity” distracts guards by transfixing their gaze for a few moments. Locksley can possess only one of these gadgets at a time—he’s part Robin Hood, part James Bond—and they are not persistent. Each one can be used only when it has been placed in a level by Alan. The oud, like the bugle, can make noise at a distance, but it can be set off after a delay. It’s like planting and then triggering a sound bomb. Using the mute, Locksley can run silently across noisy tiles—until it wears off. The figment creates a shadow of Locksley that he can summon and cast to move a bothersome guard. The gadgets keep coming. The blackjack and the folly are different versions of a stun gun that temporarily immobilizes guards. The masquerade and the veil allow Locksley to fool guards about his presence. The environments change, too, as Locksley over time gains the ability to hurdle certain walls, to disappear in shadows, to teleport from room to room. There are, alas, lasers. I did not care for the lasers. The enemies grow in variety, too. Hounds have a wider field of vision. They can’t attack, but they do summon all the other guards. Archers have a long but narrow cone of vision, and take a long time to fire off a shot. Rogues can see in a 360-degree circle. Alan becomes puckish with time, serving not only as an in-game character but also as the voice of Bithell the designer, who is not above making a Pac-Man joke in one level or bragging about the use of lamps to cast shadows in a different level. Playing 100 levels of this might seem like an imposing task, but the minimalist design, along with the small scale of each level, gives Volume a quick pace. Most impressive, though, is the clarity of the game’s design, expressed simply through colors, shapes, and lines. With The Swindle, Everybody’s Gone to the Rapture, and now Volume, video games this summer are experiencing something of a British heat wave . This is a terrific second act from one of the medium’s most promising young designers.